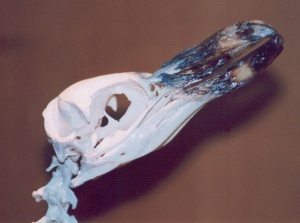 This is an X-ray (photograph) or roentgenogram of an african penguin in the zoo in Hannover (GE). 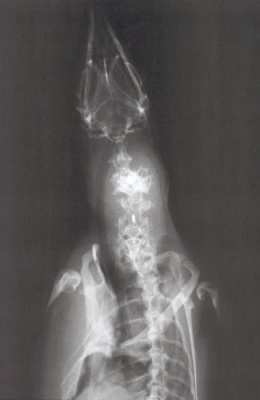 The white spot within the reach of neck/breast is an identification chip, as also is usual for dogs etc. 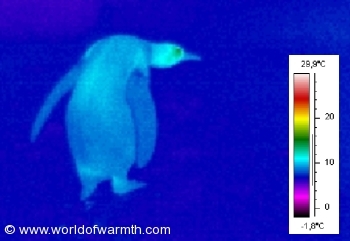 Here you find a thermographic or infrared image of a king penguin. A thermographic is a registration of the surface temperature by detecting long-wavelength infrared radiation. You can compare the image with a weather chart. It's like holding 80.000 thermometers at the same time in front of an animal. The colors added to the measurements create the image. The colors show variations in temperature. 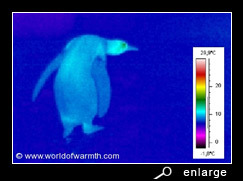 On the picture at the left, you see the penguin has no heat loss, but his surface temperature is almost equal to the temperature of the environment. 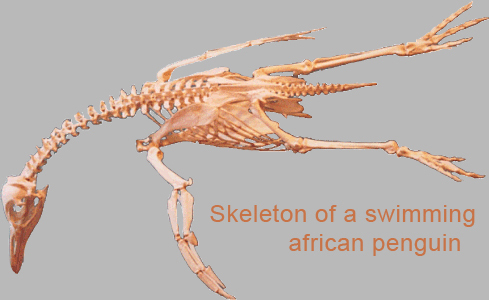 How penguins regulate their body temperature is explained at thermal insulation. Arno Vlooswijk has also made a movie with infrared images and placed it on You Tube. That movie shows several polar animals and their adaptation to chill, like polar bear, moose, seals, etc. .... After about a minute you see penguins coming out of the water like ghosts, and then warming up around eyes and head, becoming visible.